Allies of Iran's reformist President Hassan Rouhani have won a landslide victory in Tehran, in the first parliamentary vote since Iran signed a nuclear deal with world powers. 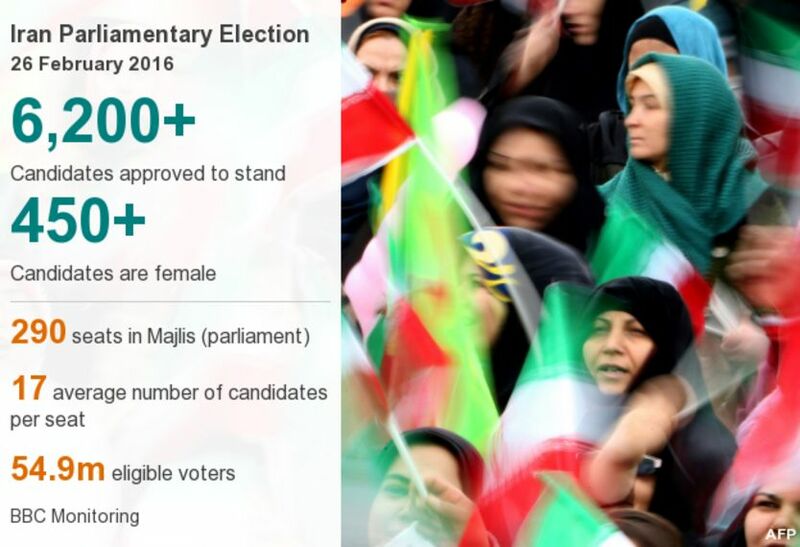 With 90% of the votes counted, the pro-Rouhani List of Hope is set to take all 30 parliamentary seats in the capital. The leading conservative candidate Gholamali Haddad-Adel is in 31st place. Millions voted on Friday to elect the 290-seat parliament as well as members of the Assembly of Experts. The 88-member assembly appoints Iran's Supreme Leader and might end up choosing a successor to Ayatollah Khamenei, who is 76 and has suffered ill-health. Early results gave former President Akbar Hashemi Rafsanjani, a moderate conservative, and Mr Rouhani the most votes for the assembly, which is composed of mostly elder and senior clerics. The results are a huge setback for hardliners. Two of the most prominent amongst them have lost their seats, and a third is hovering right at the bottom, in danger of being eliminated. The biggest shock is the poor showing for Ayatollah Mohammad Yazdi, the current chairman of the Assembly. He replaced former President Akbar Hashemi Rafsanjani when he was forced to relinquish the role. The irony is that Mr Rafsanjani is now leading the polls in Tehran. The top ideologue of the hardliners, Ayatollah Mesbah Yazdi has also lost his seat. He is the spiritual guide of a group that includes former President Mahmoud Ahmadinejad. The parliamentary result in Tehran is significant because lawmakers from the capital usually determine the political direction of the house, analysts say. However, reformists look to have done less well in constituencies outside the capital. Mr Rouhani said on Saturday that the election gave the government more credibility and clout. "The competition is over. It's time to open a new chapter in Iran's economic development based on domestic abilities and international opportunities," the official Irna news agency quoted him as saying. "The people showed their power once again and gave more credibility and strength to their elected government." Voting was extended three times on Friday as crowds reportedly flocked to polling stations. Turnout was more than 60%. Reformists, who want better relations with the outside world and more freedoms at home, were hoping to gain influence in the conservative-dominated bodies. But of 12,000 people who registered as candidates, only half were allowed to stand, including just 200 moderates. This was the first election to be held since last year's deal between Iran and world powers over the country's nuclear programme and the lifting of sanctions. BBC Persian's Ali Hamedani says the economy was a key issue in the process. With sanctions lifted and Western investors beginning to return to Iran, there are high hopes for an improvement in daily life, he says. Reformists and moderates say they are targeting greater foreign investment which, our correspondent says, will create jobs for young people.